West Coast Concrete Services is one of the state’s most preferred companies offering paver installation services at budget-friendly rates. Our portfolio includes outstanding paver structures – from patios and decks to driveways and walkways. We have worked on hundreds of paver projects in Torrance, Los Angeles, Santa Monica, and other California cities, so we can vouch for our capability as a reliable paver installer. Visit us soon or call us today so you can discuss with us your specific paver concerns. While we admit that there are other equally skilled paver installers operating in California, we’re nonetheless confident about our credentials. The most potent advantage that we have is experience. 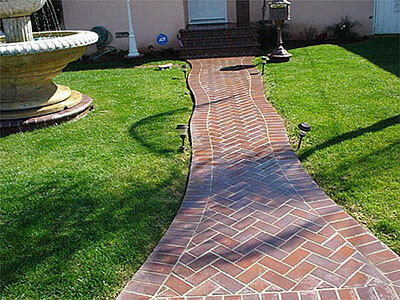 Having handled and successfully completed numerous paver installation projects for clients in Torrance and other select locations, we have practically mastered our craft and made it an art form. For example, every paver installer in our team knows what specific paver type will be perfect for particular themes that clients request. Our paver installation process is also simplified to ensure fast project completion. We offer various paver options so clients can simply pick the one that best satisfies their design taste and practical needs. Among others, we offer premium quality brick, interlocking concrete, and natural stone pavers. These paver options can be mixed or matched to achieve specific themes, like Victorian, Mediterranean, antique, modern, or contemporary. We specifically prefer interlocking pavers because of their strength and easy installation. They can also be easily repaired or replaced when needed. They also come in decorative designs that can turn a plain-looking outdoor space into a stunning area of rest and relaxation. They are also available in various shapes, sizes, and laying patterns, so customization is a breeze. Accordingly, clients like you could simply tell us your design ideas, and we will suggest the best theme and the paver type to use. We could also just present you some of our previous works so you can simply take your pick. If you are looking for an expert paver installer, then please contact us at West Coast Concrete Services. We are particularly known for our high quality installation and the speed at which we finish our handled projects. We do this by following a systematic approach to preparing areas where the pavers are to be installed. We also use task-appropriate tools and equipment to make our jobs easier – from simple hand tools to heavy equipment like soil compactor. With us, you’re assured of commendable results in the form of the stunning paver amenities that we will install for you. With our decades of experience as a paver installer in California, we have already tried and tested different brands of pavers. And one of the paver manufacturers that we highly recommend is Belgard. They have an extensive line of first-class paver products that can be used in various paving applications, such as patios, walkways, driveways, and the like. Our access to these extraordinary materials allows us to fully satisfy clients’ specifications and to ensure the durability, functionality, and stunning quality of all paver structures that we install. If you have questions or concerns, please feel free to dial our hotline at 310-466-4456, and our in-house paver installer will be pleased to answer all your queries. We serve Torrance, CA and other areas nearby.